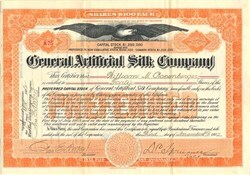 Beautiful certificate from the General Artificial Silk Company issued in 1902. This historic document was printed by American Banknote Company and has an ornate border around it with a vignette of an eagle. This item has the signatures of the Company's V. President, Daniel C. Spruance and Secretary and is over 107 years old. In 1910, Rayon made from cellulose was commercially produced by the American Viscose Company in Marcus Hook, PA. Production in 1911 amounted to 362,000 pounds. The patents were acquired from the General Artificial Silk Company, Landsdown, PA, who started producing the product, calling it �artificial silk.� The term �rayon� was adopted in 1924 to replace �artificial silk� and similar names. July 7, 1903 - Eppa H. Ryon, of Waltham, MA, and Charles N. Waite, of Landsdowne, PA, received a patent for an "Apparatus for Producing Artificial-Silk Filaments" ("fibers of filaments are formed from solutions of cellulose or other material...machine of this character which will produce a thread or filament of a uniform size regardless of the viscosity of the cellulose solution"); assigned to General Artificial Silk Company; May 10, 1904 - Charles N. Waite received a patent for the "Manufacture of Filaments of Flms from Viscose" ("especially valuable in the manufacture of the filaments commercially known as "artificial silk"); assigned to General Artificial Silk Company; acquired by American Viscose Company, Marcus Hook, PA; 1910 - American Viscose Company first commercially produced rayon; 1911 - 362,000 pounds produced; 1924 - term rayon adopted.